The 1989 elections proved to be the first “quiet” popular revolution against the party-state apparatus. They gave a powerful signal about the declining popularity of the regime. Although the Communists gained a parliamentary majority, great damage was done to the party’s prestige as many of its high-ranking representatives, the crème de la crème of the Soviet establishment, were rejected at the ballot box. The elections revealed an important pattern: every time the authorities tried to prevent an independent candidate from taking part in the elections, either by means of administrative pressure or by seeking to discredit him, the voters were even more determined to support the “antiestablishment” candidate. In other words, the less popular the candidate’s standing with the authorities, the higher his popularity rating with the electorate. Boris Yeltsin’s case was a prime example of this tendency. The party’s top hierarchy orchestrated an unprecedented dirty tricks campaign to discredit the former first secretary of the Moscow City Committee, who had been removed from his post in November 1987 for his calls to accelerate reform. 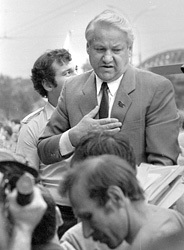 However, far from defeating him, the intrigues of the party nomenklatura against Yeltsin—which were no doubt approved by Gorbachev personally—actually reinforced his popularity in the Moscow electoral district, where he was running, bringing him a resounding victory with a record 90 percent of votes and a standing of a popular hero. The electoral campaigning in the spring of 1989 also gave rise to novel forms of spontaneous collective action and political behavior unthinkable under Gorbachev’s predecessors. These included unsanctioned mass rallies, which were a clear indication of the growing radicalization of the popular mood. The rallies featured speakers and protesters whose calls and demands went beyond Gorbachev’s controlled liberalization and threatened to destabilize the Soviet regime. For the first time Gorbachev’s efforts to elicit popular support for his reform backfired, undermining not just his conservative opponents but also him personally. A threat even more dangerous than mass rallies was the resurgence of the working-class movement. In the summer of 1989 miners’ strikes were held. They challenged the very legitimacy of a system established on the claim that it represented the working class. Rapidly, the miners’ strikes became overtly political, even revolutionary, demanding an end to the Communist Party’s power monopoly.